Specifically engineered for Manifold Converter equipped vehicles. Tubular and cast manifold styles. Feature "Clean By Design" ceramic substrates for maximum pollution reduction. 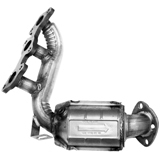 Designed for higher heat and demanding conditions near engine. Industry's most comprehensive Manifold Converter coverage. 409 stainless steel materials construction for longer life. Hardware & Gaskets included with many converters. Bolt-on like original converter for easier installations. Manufactured from high quality materials. Design meet needs of OBDII equipped vehicles. 5-year/50,000 mile warranty on converter body. Copyright © AP Exhaust Technologies, Inc. All Rights Reserved.